If you only use your servers from 9am to 5pm each day, why pay for the whole 24 hours? CMM allows you to control EC2 servers so they work only when you do. PAYG customers are charged for servers even when they’re not in use and turning them off can save your business a lot of money! CMM also works in tandem to a schedule, but with the bonus of allowing staff to work odd hours whenever they need. With server automation, CMM can turn your servers off when they’re not in use (although, it’ll warn you with an email before doing so!). In addition, you can use CMM on the go to switch your servers ‘ON’ or ‘OFF’ at the touch of a button, using the CMM Mobile Starter App for smartphones, available for both iOS and Android devices. That’s real-time on-demand control of your Amazon EC2 servers on your mobile phone! The savings you can make with CMM could be enough to actually upgrade your server, or spin up a new server. That means more power without the extra cost! CMM is designed to be quick to set up and get running and then easy to use. The mobile app is an easy way to control your EC2 servers, even if you aren’t very technical. 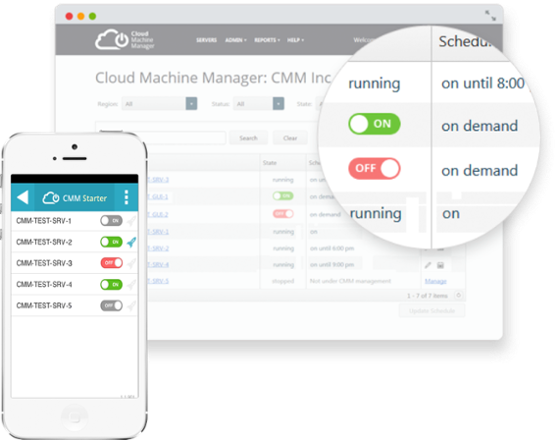 By turning your EC2 Servers off when they’re not in use (possibly for as much as 16 hours a day), CMM stops you wasting money and allows you to save on your cloud spending. 1. How many Amazon Servers can I use with CMM? As many as you need – unlimited. 4. How much does CMM cost? $5 to $20 a month. See Pricing table here for more info. 2. How much money will CMM save me? Based on a medium sized machine over the course of a year, we calculate savings at $750. 5. How do I know CMM will save me cash? Try CMM for a month and see the results for yourself before purchasing. Zero risk. 3. How complicated is CMM to set-up? 6. How long am I tied in for when I purchase? Cancel anytime. No long term contracts. 7. Is there an app for CMM? Yes, the CMM Starter App is available for both iOS and Android devices. You can download it here.